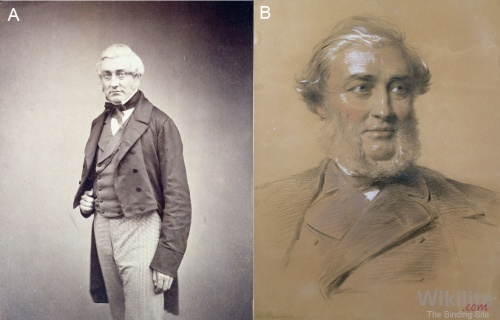 Dr William MacIntyre was the first person to characterise the precipitate in the urine from a patient with multiple myeloma, and his findings were reported by Henry Bence Jones in a Lancet article in 1847. Korngold and Lapiri characterised two types of Bence Jones protein (subsequently designated κ and λ in tribute to them). Tiselius reported how serum globulins can be separated into alpha, beta and gamma fractions using moving boundary electrophoresis. Waldenström described the key concept of monoclonal vs. polyclonal gammopathy. Figure 2.1. Henry Bence Jones (A) Albumen print by Maull and Polyblank c.1850s (B) Charcoal and chalk on paper by George Richmond 1865. (Reproduced with permission from The Royal Institution, London, UK and Bridgeman Images). Although immunoglobulin free light chains (FLCs) are synonymous with Bence Jones proteins, history might have been more generous to others involved in their discovery . On Friday, October 30th 1845, the 53-year-old Dr William MacIntyre, physician to the Western General Dispensary, St. Marylebone, London, left his rooms in Harley Street. He had been called to see Mr Thomas Alexander McBean, a 45-year-old, highly respectable grocer, who had severe bone pain and fractures. He had been under the care of his general practitioner, Dr Thomas Watson, for several months. Upon examination of the patient, William MacIntyre noted the presence of oedema. Considering the possibility of nephrosis, he tested the urine for albumin. To his consternation, the albuminous protein precipitate found on warming the urine, uncharacteristically, redissolved when heated to 75°C. The tube contains urine of very high specific gravity. When boiled it becomes highly opaque. On the addition of nitric acid, it effervesces, assumes a reddish hue, and becomes quite clear; but as it cools assumes the consistence and appearance which you see. Heat reliquifies it. What is it?" “I need hardly remark on the importance of seeking for this oxide of albumen in other cases of mollities ossium”. Bence Jones’s reputation was assured, while the contributions of his colleagues were consigned to the footnotes of history. For all the apparent injustice to his colleague, William MacIntyre, Henry Bence Jones achieved much else in his career. He published over 40 papers and became rich and famous based on his clinical practice, lecturing and original observations, and was elected to fellowship of The Royal Society at the tender age of 33. Florence Nightingale once described him as “the best chemical doctor in London.” Surprisingly, there was no mention of Bence Jones protein in his obituary and the eponym (and the hyphen in his name) was not used until after his death . By 1909, over 40 cases of Bence Jones proteinuria had been reported , and the protein was thought to originate in bone marrow plasma cells that were first identified by Waldeyer in 1875. In 1922, Bayne-Jones and Wilson characterised two types of Bence Jones protein by observing precipitation reactions using antisera made by immunising rabbits with the urine of several patients. The proteins were classified as group I and group II types. However, it was not until 1956 that Korngold and Lapiri, using the Ouchterlony technique, showed that antisera raised against the different groups also reacted with myeloma proteins. As a tribute to their observations the two types of Bence Jones protein were designated kappa and lambda (κ and λ). Edelman and Gally, in 1962, subsequently showed that FLCs prepared from IgG monoclonal proteins were the same as Bence Jones protein. It had taken 117 years from the original observation for the function of Bence Jones protein to be finally determined.